Resonate CDConsole™ software is integrated with Central Dispatch software load balancers, and is designed to address the requirement of 24/7 availability for mission-critical applications. 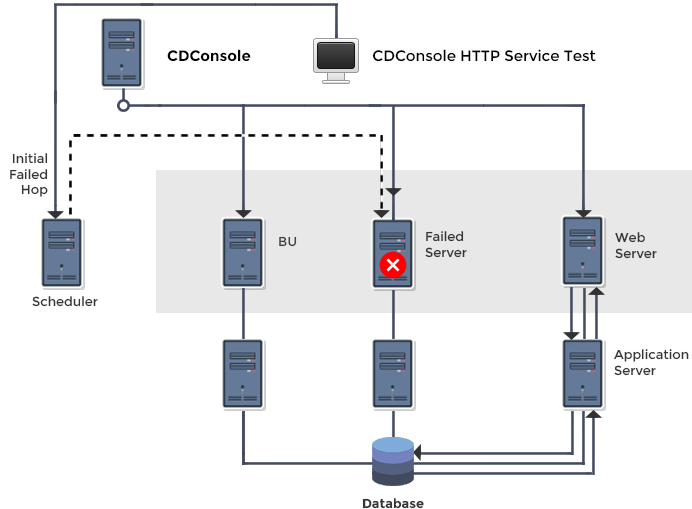 CDConsole provides end-to-end monitoring and troubleshooting, combined with automated implementation of traffic management policies to ensure maximum application performance and service levels. Current server load balancing solutions choose a particular server simply based upon how that server responded to previous requests, and using that response time information to estimate server health. Resonate Central Dispatch load balancer provides additional insight into the health of servers by placing software agents onto the servers. The agents send status updates containing information such as the current CPU load of the server, and the number of open connections on that server. However, other resources in the network may be critical to the ability of a particular server to satisfy a request. For example, if a web server is dependent upon a failed application server to provide a user response, then traffic should not be directed to that server, even though the web server is completely functional (as far as the server load balancer can determine). With CDConsole, the health and performance of resources such as application servers and database servers can be taken into account during the traffic management decision. This is accomplished through automated control of the Central Dispatch configuration based upon the receipt of events, which are generated when problems are detected in back-end resources. In situations where a variety of problems may occur both on the web server, and on external resources such as a database server, Resonate can quickly identify and avert problems before they occur. Some of these problems are handled completely by Central Dispatch, while others require the CDConsole multi-tier resource monitoring and control. Using the CDConsole, all of these occurrences can be handled without administrator intervention at the time of the error. The administrator simply needs to configure CDConsole to test the health of these resources and then implement rules, which specify a corrective action to take when one of these errors occurs. When an application server reaches its overload threshold, Resonate will route less traffic to the corresponding web server, ensuring that the application server does not become overloaded. If Resonate Central Dispatch is not clustering the application servers in this scenario, it cannot provide load balancing at that tier. However, CDConsole has built-in capabilities that can monitor performance and trigger specified events when overloaded, enabling Central Dispatch to allocate appropriate amounts of requests to the overloaded application server by metering requests to the corresponding web server. For more information on how Resonate can help you guarantee the end-user service levels for business-critical applications while cutting operating costs, contact a sales representative at sales@resonatenetworks.com, or call 408-545-5501 for more information.